ID Card Ribbons, Full Color (YMCKO) Color dye film, 300 images. 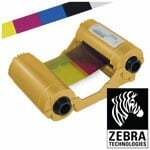 The ribbon is used to print in a variety of colors: yellow (Y), magenta (M), cyan (C), and black (K). The remaining overlay (O) provides an extra layer of protection for the card. This ribbon is used to print text and full color images on one or both sides of the card. Compatible with Pronto, Enduro, Enduro+, Enduro3E and Rio Pro ID Card printers.